Homestead Fence Company, offering quality alumnium fencing and chain link fencing for residential and commerical customers. 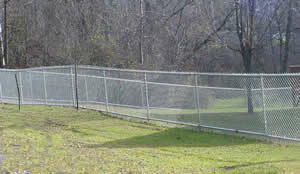 Chain link fencing has many benefits and uses for each individual application. Chain link fences are often utilized for commercial security, pools, play areas, and containment of pets and children. Chain link fencing is ideal for a dog kennel that is a concrete, around a ball field, or at a temporary consutrction site. The wire mesh is put up tight and should never need to have any maintenance done to it. The wire should last a lifetime under normal conditions. The fence can be top dressed with barbed wire or even razor wire. The wire can also be dressed up with a vinyl coating of many different colors. Aluminum fencing is a relatively a new option in the fencing market. There are many different styles and applications, such as security and containment. Most often, aluminum fences are used as pool enclosures to enhance security. Aluminum fencing can be a great enhancement to many yards and does a great job containing pets and children. Overall, there is very little maintenance, and aluminum fencing products should last a lifetime as compared to a wood fence.